Magical Charms: The Sorcerer’s Apprentice ultimately delivers just what it promises: a lively tale of improbable heroism. Honestly, I don’t ask for much when it comes to summer comic adventures like The Sorcerer’s Apprentice. I only ask that they be, you know, comic and adventurous. Disney goes two for two in this surprisingly breezy tale of how a New York fourth-grader named David has a traumatic encounter with two sorcerers with a centuries-long history. 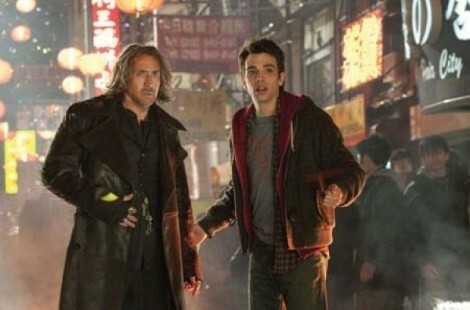 Ten years later, David (Jay Baruchel) is now a college physics nerd, and those two rival sorcerers have found him again. Balthazar (Nicolas Cage) is a disciple of Merlin, who believes David is destined to become a great wizard himself. And Horvath (Alfred Molina) wants to resurrect Merlin’s ancient enemy Morgana to wreak destruction on humanity. In case you’re keeping count, this marks about the dozenth attempt in recent months to re-create the Star Wars/Harry Potter model of a youngster coming to terms with playing a crucial role in world-shaking events. This variation from director Jon Turtletaub (National Treasure) never takes itself too seriously, effortlessly combining the charm in Baruchel’s self-deprecation, the appeal of a just-crazy-enough Cage and the dapper villainy of Molina. Together, they’re a terrifically entertaining tandem. They need to be, because there’s not much else about the film that’s wildly original. The obligatory romantic interest for David (Teresa Palmer, scarily resembling a bleached-blonde Kristen Stewart) has little personality of her own, and there’s a bit of a missed opportunity with the cocky stage magician (Toby Kebbell) who becomes Horvath’s minion. When Turtletaub and his screenwriters resort to re-creating the famous self-cleaning mops and brooms sequence from Fantasia, it’s a wink to the title’s origin that feels more self-congratulatory than organic. Yet, The Sorcerer’s Apprentice ultimately delivers just what it promises: a lively tale of improbable heroism served up with a generous helping of humor. Fun isn’t just a formula; it comes from putting the right people in the position to create a little bit of summer-movie magic.